Pastor John E. Blackmon is a native of Norlina, NC, and was educated in the Warren County Public School System. In April 1970, he joined the U. S. Army and was honorably discharged in December 1971. Pastor Blackmon was employed by the Washington, DC Metropolitan Police Department, serving 24 years and retired January 1994. From 1983 to March 3, 1991, Pastor Blackmon was pastor of Mt. Olive Baptist Church in Centreville, VA; however, God gave him a vision to start a church. Thus, First New Birth Baptist Church was organized on September 27, 1991 in Pastor Blackmon's home. Pastor Blackmon is treasurer of the Northern Virginia Minister's Conference, a member of the Northern Virginia Baptist Association Ordaining Council; a member of the Baptist General Convention, a member of the Hampton University Minister's Conference, Hampton, VA., a former member of the Manassas City School Pro-Active Discipline Review Board, a former member of Manassas City School 2000 Committee, the past Vice President of the Prince William County NAACP, a former member of the Prince William County Criminal Justice Advisory Board, and a former member of the Prince William County School Human Relations Advisory Board. In May 1985, Pastor Blackmon graduated from the Washington Bible College in Lanham, MD. 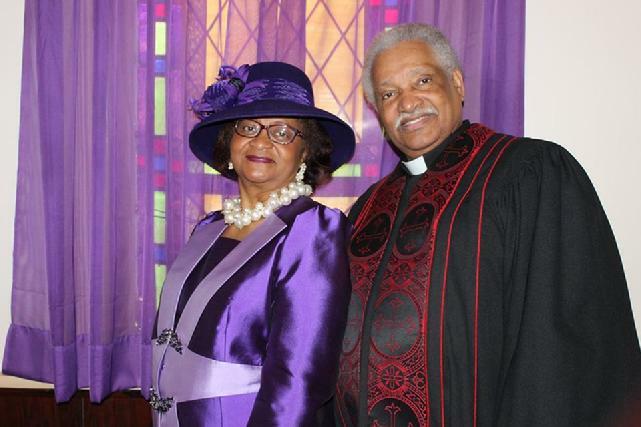 Pastor Blackmon is married to Hattie Campbell Blackmon, and they have four children Catina, Charita, Christie, and John, Jr.; two son-in-laws Walter Jackson and Kevin Eley; and five grandchildren Nyemah, Tiana, Jasmine, Kevin II, and Chloe. Hattie C. Blackmon, a native of Vanceboro, North Carolina, is the wife of Pastor John E. Blackmon, Sr., and First Lady of First New Birth Baptist Church in Manassas, VA. She is a deaconess and serves in several other capacities to include ministering to women who are incarcerated. In addition, she serves as her husband’s helpmate and is the mother of three daughters and one son. In 1986, First Lady Blackmon was given "divine direction” to start a prayer organization. Excited about this and being a woman of prayer and great faith, this vision became a reality when she stretched forth her hands of faith and introduced this vision to the other women in the congregation. Thus, “Women-in-Prayer” was organized. All were in agreement that prayer is necessary; therefore, the third Saturday of every month was designated as “Women-In-Prayer.” The women intercedes in prayer for the Pastor, the Church, the World, the Nation, the State, and the Community. First Lady Blackmon keeps her husband, family, and church lifted up in prayer daily. She believes that all things can be done by prayer because prayer and faith move God. "Therefore I say unto you that what things so ever ye desire when ye pray, believe that ye receive them, and ye shall have them."